These high-quality, feature-rich flight training devices come at a price that flight schools can actually afford and run on a single 20 amp 110V outlet (15 amp for the TD). 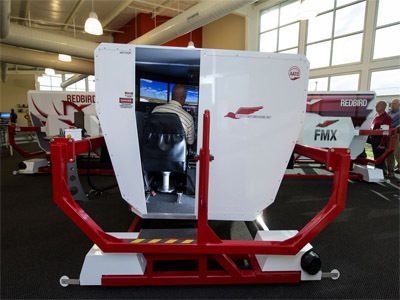 Designed to enhance the training experience for pilots of all levels, from student to ATP. Available exclusively from King Schools! The flagship of the Redbird family. A fully enclose cockpit with +200° visuals and yaw, pitch and roll motion. A fully enclosed Advanced Aviation Training Device with wrap-around visuals. An excellent choice when space is a premium. 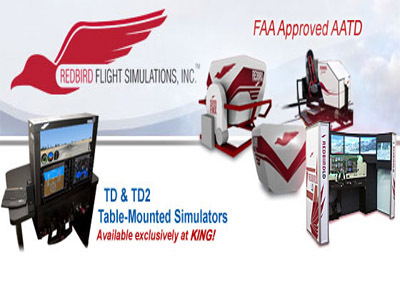 The power of a Redbird for your home or office.Realistic flight controls and interchangeable cockpit. Master crosswind landings. The Xwind is capable of simulating 30 knot crosswinds and 15 knot gusts. Designed with ergonomics in mind, this system is the most realistic and effective glass or analog simulator on the market. Connect your favorite flight sim to your favorite aviation app running on your iPad or iPhone. Tethered or wireless.